Favourites to contest the title, the top two seeded pairs both emerged successful at the quarter-final stage of the Women’s Singles event at the 2018 ITTF Challenge Belgosstrakh Belarus Open in Minsk, as play began on the morning of Saturday 17th November. Success without any great moments of alarm was secured by the combination of Slovakia’s Babora Balazova and the Czech Republic’s Hana Matelova, as it was by Japan’s Satsuki Odo and Saki Shibata. Silver medallists earlier in the year in Poland when beaten by the Korea Republic combination of Jeon Jihee and Yang Haeun, Babora Balazova and Hana Matelova, the top seeds, overcame German qualifiers Chantal Mantz and Wan Yuan (9-11, 11-9, 11-9, 11-9). A four games win for Babora Balazova and Hana Matelova, it was the same margin of victory for Satsuki Odo and Saki Shibata, a pair in good form. 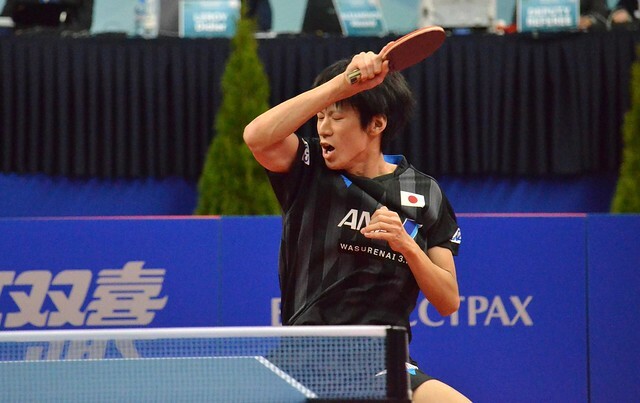 The no.2 seeds, three weeks ago, they had emerged the winners at the 2018 ITTF Challenge Belgium Open in De Haan when securing the title at the final expense of Luxembourg’s Sara de Nutte and Ni Xia Lian. On the penultimate day in Minsk, the Japanese duo overcame Korea Republic’s Lee Sobong and Yu Sora (7-11, 11-8, 11-2, 11-8). Defeat for Lee Sobong and Yu Sora, it was the same outcome for their colleagues, Kim Hayeong and Lee Eunhye, likewise a pairing who had been required to compete in the two day qualification tournament. They were beaten by the Czech Republic’s Karin Adamkova and Aneta Kucerova in four games (15-13, 4-1, 11-9, 11-8), a pairing that in a similar vein had negotiated the preliminary round. At the semi-final stage, in the lower half of the draw Karin Adamkova and Aneta Kucerova face Satsuki Odo and Saki Shibata; in the top half, Barbora Balazova and Hana Matelova confront Guo Ruichen and He Aige, the Chinese duo receiving a quarter-final walk-over when scheduled to face Croatia’s Mateja Jeger and Sun Jiayi, the no.5 seeds. The semi-final matches will be conducted later in the day as the afternoon session of play comes to a close.